Dog toys and cool gadgets. Pond Pumps, Air Pumps and Heat. EHEIM CLASSIC 350/600+ 2215/2217 PLUS EXTERNAL FILTER + MEDIA FISH TANK AQUARIUM. Eheim Classic Plus External Filter. Please use the drop-down menu to select your preferred. The following options are available from Aquacadabra. EHEIM Classic 350+ (2215) Plus External Filter. EHEIM Classic 600+ (2217) Plus External Filter. Please note: we also stock the 250+ (2213), available in a separate listing - here. &###xA0; The Eheim classic range of filters gives you everything that makes up a good external filter. By choosing a classic you won&###x2019;t go wrong. Because you have chosen a reliable, million fold tried and tested piece of equipment. All models perform to the highest quality standards. First class components and carefully matched features ensure perfect pump and filter performance. Additionally, you have the proverbial Eheim quiet running, robust durability and low energy consumption. 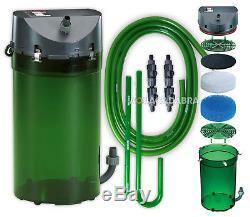 Comes complete with filter media (activated carbon pad, fine filter pad, coarse filter pads). Long-lasting flexible silicon sealing ring in pump head (for easy and safe replacement after cleaning). Can be filled with filter pads and/or loose filter media. Comes with spray bar, inlet pipe, hose and installation accessories. Suitable for fresh and saltwater tanks. EHEIM 2215 (PLUS MODEL / CLASSIC 350). Container Volume; 4.8 Litres. Aquarium Size; Up To 120 - 350 Litres. Dimensions; 370mm (H) X 185mm (Diameter). EHEIM 2217 (PLUS MODEL / CLASSIC 600). Container Volume; 6.6 Litres. Aquarium Size; 180 - 600 Litres. Dimensions; 400mm (H) X 205mm (Diameter). Unfortunately couriers pass on aditional shiping charges for these locations which we have to pass on. There are many reasons to shop online with Aquacadabra. We aim to resolve this type of problem in as timely a manner as possible. There are a number of circumstances when you may wish to cancel and/or return goods ordered. Once the Company has received and acknowledged your requirement, they will provide you with the necessary procedure which you must ensure is followed. Please also note it is your responsibility to get the item back to us at your cost in a new undamaged condition. When returning goods, we recommend that you use a courier or deliver them personally to our Head Office. The Company accepts no responsibility for damage that is incurred in transit when returning goods, or for goods that are lost in transit. Order Cancellation or Changes to Orders. Once an order has been placed it will be processed almost immediately. This means if you wish to cancel the order you will need to send the goods back to us once received. This listing is currently undergoing maintenance, we apologise for any inconvenience caused. The item "EHEIM CLASSIC 350/600+ 2215/2217 PLUS EXTERNAL FILTER + MEDIA FISH TANK AQUARIUM" is in sale since Saturday, November 15, 2014. This item is in the category "Pet Supplies\Fish & Aquarium\Filters". The seller is "aquacadabra" and is located in bexleyheath,kent. This item can be shipped to United Kingdom, United States, Japan, Canada, Ireland, Australia, Germany, France, Greece, Italy, Spain, Russian federation, Austria, Belgium, Bulgaria, Croatia, Cyprus, Czech republic, Denmark, Estonia, Finland, Hungary, Latvia, Lithuania, Luxembourg, Malta, Netherlands, Poland, Portugal, Romania, Slovakia, Slovenia, Sweden, Brazil, New Zealand, China, Israel, Hong Kong, Norway, Indonesia, Malaysia, Mexico, Singapore, South Korea, Switzerland, Taiwan, Thailand, Chile.